The curved legs were one of the things on the list of “gotta haves” for this table. I’m still limited to the 4/4 lumber and I don’t own a band saw. 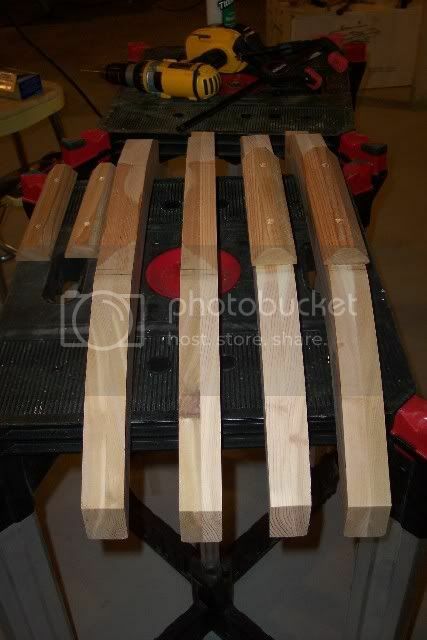 So I milled up 8 pieces to 3/4” and glued them up to make four 1 1/2” blanks. 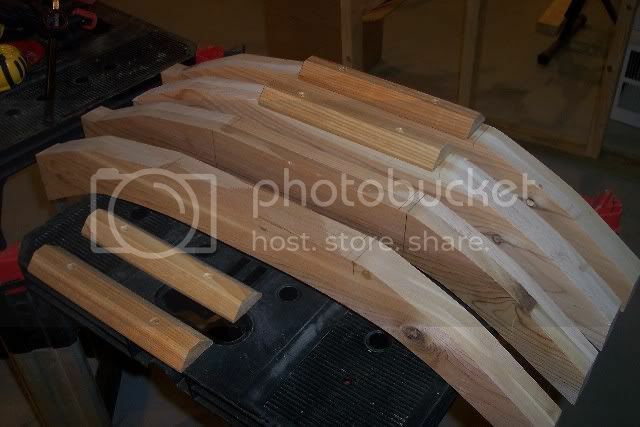 I used my jig saw to rough them out then sat down with the sander and a couple cups of coffee. Cut some pieces for a frame to brace the legs and a quick dry fit. 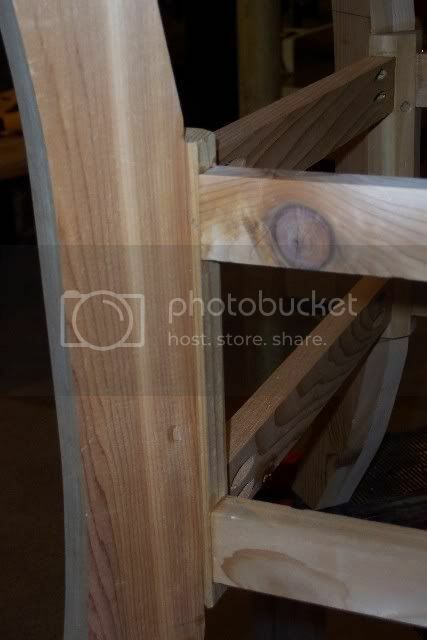 Details of the frame supporting the legs. One of the requirements for the table was that the top needs to be removable so that it’s easy to bring in for the winter. So here’s what I came up with. 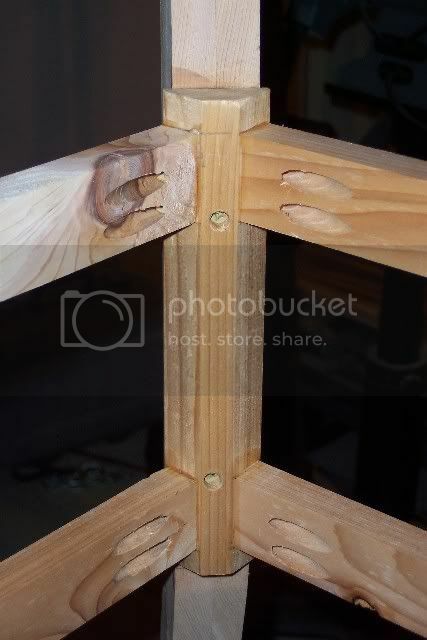 The top rests on the legs, the legs slip in between the blocks, and the 1/4” bolt keeps the top from flipping over. The bolt only gets hand tightened. I intentionally left the fit between the bocks sloppy to allow for movement and so that you don’t have to acheive “perfect” alignment when putting it back together in the spring. One more dry fit before calling it quits for the day. By Gosh, Shaun, this looks like a good plan. If you don’t mid I might steal some of it and make something similar. We need one. Thanks for sharing. Where there’s a will, there’s a way, Shaun. 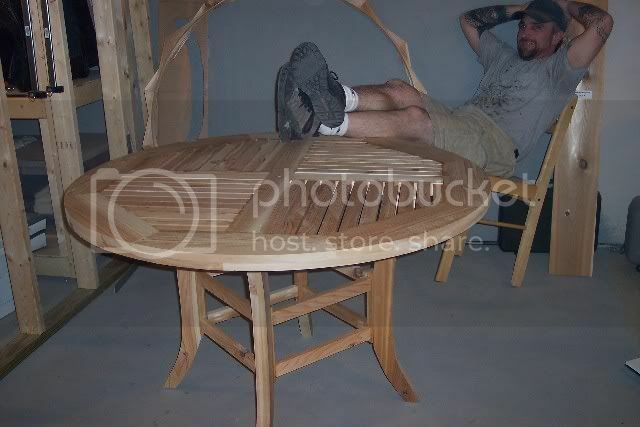 I can just imagine how much work went into this table the top looks terrific and the curved legs are perfect for it. Don, it’s been a fair amount of work and I’ve still got some to go yet. All I had to work from on this was a picture so it was a bit of a challenge but hey… figuring out how you’re going to do it is half the fun now isn’t it? awesome table Shaun. The curved legs are really nice. 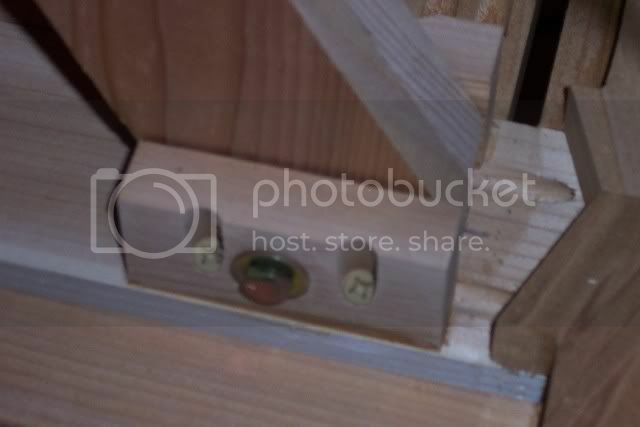 What kind of wood did you use for the project? 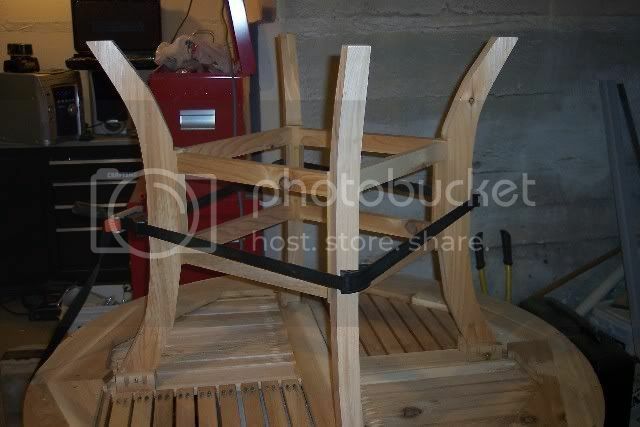 Shaun: Great table there and I see that you are also checking out the joinery of the chair. Thanks for the compliments. It’s one thing to get complimented on your work but the comments mean a whole lot when they come from folks who are familliar with the work and have a true appreciation for what went into it. Bryano – it’s Western Red Cedar. The table that it’s modeled after was Teak but that was cost prohibitive. 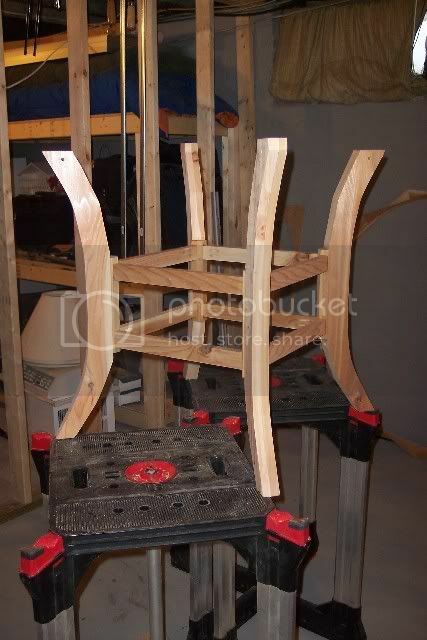 Karson – the chairs will be next. I need to get the table sanded down and put a finish on it first. I want a super tough finish for it so I’m thinking System Three’s Spar Urathane. It’s outdoor furniture and I want it to keep it’s color and protect it from the weather as much as possible. Anybody got any thoughts on the finish? I’ve never tried it on Cedar but the the new thing in marine finishes is Cetol “Clear”. It doesn’t have the orange appearence the older Cetol finish has. Plus they added some UV inhibitors. The stuff is pretty tough too. No chipping or scratches. Little to no maintenance is required for the finish either. Your customers could probably just spay it with fresh water. They recommend a maintenence coat every year but if the project is going to be inside part of the year it will probably last longer. The draw back is like any other marine grade products it’s pricey, almost $40 a quart.